In the 17th century a large part of Europe was under the spell of the Italian style. In Germany it was especially welcomed: most composers integrated one or several features of the latest trends in Italian music. One of the most enthusiastic advocates was Johann Rosenmüller. In his earliest works the influence of Heinrich Schütz, in the mid-17th century Germany's main composer, is clearly noticeable. Schütz, on his part, had already embraced some elements of the Italian style. Rosenmüller showed his leanings towards that style well before he actually settled in Italy. That was in Venice, to be precise, where he took refuge when he was accused of a pederastic offence in Leipzig. In Venice he became a sackbut player in San Marco and probably also worked as a teacher. At the same time he continued to compose, especially large amounts of sacred music. A large part was on German texts and obviously intended for the German market. There he was held in high esteem since the publication of two collections of sacred concertos under the title of Kernsprüche, printed in 1648 and 1652/53 respectively. These found a wide dissemination in Germany. He also composed sacred works in Latin, for instance in honour of the Virgin Mary. These were probably performed in San Marco. They also have given food to the speculation that Rosenmüller might have converted to Catholicism. However, there seems to be no documentary evidence of that. Rosenmüller also contributed to the genre of instrumental music. In the first half of the 17th century German composers mostly wrote dances, often put together in suites. Examples are Johann Hermann Schein (Banchetto Musicale, 1617) and Johann Vierdanck (two collections from 1637 and 1641). 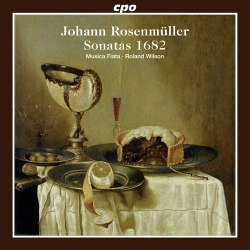 In 1645 Rosenmüller published a collection with dance suites of his own. In contrast to Schein he added a basso continuo part. It was followed in 1654 by the Studenten-Music, which is harmonically and melodically more developed. The two collections which have attracted most interest in our time date from 1667 and 1682 respectively. The former is called Sonate da camera and is for five instruments and basso continuo. The latter is the subject of the present recordings, the Sonate à 2, 3, 4, è stromenti da arco & altri. They were both printed in Germany, and it is therefore plausible to assume that they were first and foremost aimed at the German market. This has some consequences in regard to the scoring. Both collections refer to strings or other instruments. François Filiatrault, in his liner-notes to the ATMA disc, writes: "The title indicates that though other instruments may play them, these pieces are primarily intended for strings". In the liner-notes to the CPO recording Jörg Hillebrand states that "the instrumentation with various instrumental types is again left up to the preference of the performers". It is impossible to decide who is right. The fact that strings are mentioned first doesn't necessarily indicate the preference of the composer. It seems more likely that strings were more common than instruments such as cornetts and sackbuts. 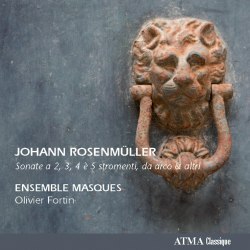 The performance by the Ensemble Masques reflects the practice of playing such music in domestic surroundings and the private rooms of aristocrats. A performance with wind could well have taken place at public occasions. In this scoring they take on the character of representational music. Both approaches seem perfectly legitimate. It is the character of the music which is decisive. Some sonatas are played with strings by Musica Fiata as well, such as Sonata II, Sonata IV and Sonata VII. In other sonatas the instruments are used in various ways. Some are played with cornetts and sackbuts (Sonata XII), others with a mixture of violin and cornett (Sonata I), violin and three wind instruments (Sonata VIII) or with several wind and strings, which sometimes alternate and then play colla parte (Sonata IX). The latter option has a chiaroscuro effect through a contrast between soli and tutti. The scoring in the performances of the Ensemble Masques is the same throughout, with the exception of the string bass. In some sonatas the viola da gamba is played, in others the cello. Considering that these sonatas were aimed at the German market the latter option seems questionable: at the time of publication the cello hardly played a role in Germany. Musica Fiata uses an instrument which is called basso viola. I have not been able to identify this instrument. An internet search reveals that this term only indicates the pitch of the instrument, not whether it is of the viola da gamba or part of the violin family. These sonatas are not only often quite virtuosic, they also have a strongly theatrical character. They usually comprise a number of movements of contrasting tempo, but these movements are sometimes divided into short sections, some not longer than a couple of bars. An example is the Sonata XI which lasts four and a half minutes, but has no fewer than six movements. The first comprises five sections, alternating allegro and adagio, the fourth movement also has five: adagio-presto-adagio-presto-adagio. Sometimes the transition from one movement to the next can be very abrupt. That comes off a bit better in the performances by the Ensemble Masques. That could well be due to the fact that strings are just a little more flexible and responsive to changes in the texture than cornetts and sackbuts. On the other hand, Musica Fiata's performance has slightly stronger dynamic contrasts; these could have been more pronounced in Ensemble Masques' recording. In most cases I would regret the release of two recordings of the same pieces; not here. The approaches are quite different, and the performances are both very good in their own right. I see these releases as complementary rather than competitive. Everyone who likes Rosenmüller's music will feel tempted to acquire them both.